Misty Mountain Shilohs and High Caliber Shilohs are very excited to announce the pairing of High Caliber’s Dark Knight to MSprCH NSbCH Sunshine’s Lady Sophia CGC. Our Sophia is a beautifully coated, gray sable, plush female who was proudly bred by Sunshine Shilohs out of the stunning sire/dam combination of multiple top award winning, GRAND VICTORx6, Master Supreme Grand Champion, Sir Harley of Shenandoah and multiple top award winning, 4xNational Select, Grand Champion Catoctin's Rae of Sunshine. 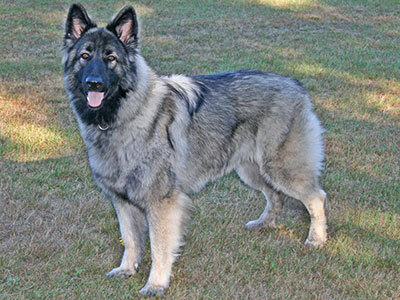 She is truly an exceptional representation of the Shiloh Shepherd breed in both temperament and confirmation. 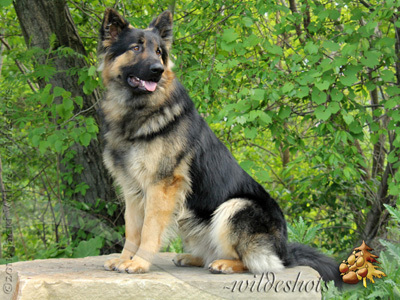 One of her awesome assets that she brings to this breeding is her pure old line Shiloh Shepherd pedigree which carries zero outcrosses and which is built on the high excelling championship lines. Along with Sophie’s outstanding pedigree and health statistics, she has also proven herself to the standard by doing very well in the show ring easily obtaining her Master Supreme championship and receiving early National Select status. Her temperament is medium –soft creating a very obedient and highly intelligent animal. Sophie was often used as an example by the trainer in obedience classes because she was such a fast learner. She is devoted to her family, follows us around constantly and intuitively protects us from the evil chipmunks in the yard. She does have a high prey drive and will willing give chase to things that challenge her yard. Sophie rounds out her assets by excelling in agility class. Some of her listed accolades are: TSSR Female puppy of the year 2009, ISSDC National Select #1 2009, NAKC Master Supreme Champion, AKC CGC 2009. Brutus is from the first litter born here at High Caliber out of our very own Kiana and Murphy in beautiful Snow Shoe, Pennsylvania. I named him High Caliber’s Dark Knight because he seemed so noble and chivalrous to me, and of course because his coat was so black. We called him Brutus and he continued to grow into a dog befitting that name, weighing in at over 100 pounds at 7 months.Brutus started his show career by winning Best Puppy in Specialty at the TSSR specialty in Brookville, PA. A few months later, we traveled to Ontario, Canada for the Shiloh Shepherd International Show and there he won Best Junior Puppy in National as well as Reserve Winners Dog against all the older Shilohs. A few months after that, Brutus won the title of Top Champion of 2010 with the NAKC followed by our first adult Best In Show win a couple weeks later. Both when he was only 10 months old. Brutus is a large stunning dual sable who is gentle and kind to everyone: adults, children, cats and dogs. He is a handsome boy with a big, broad head, wide chest and tons of bone and is just the biggest sweetheart. Their virtues complement each other wonderfully and we anticipate large puppies with heavy bone, broad heads and exceptional structure. Sables and duals in plush coats are expected and the possibility of some blacks! Temperaments will be medium to medium-soft. Excellent hip and health statistics can be found in both sire and dam. 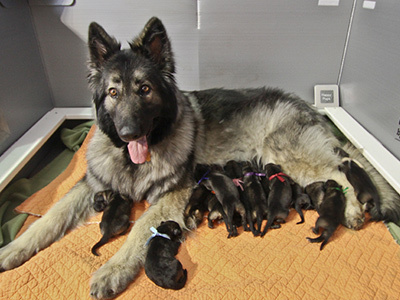 This is Sophia’s second breeding and first breeding for Brutus.